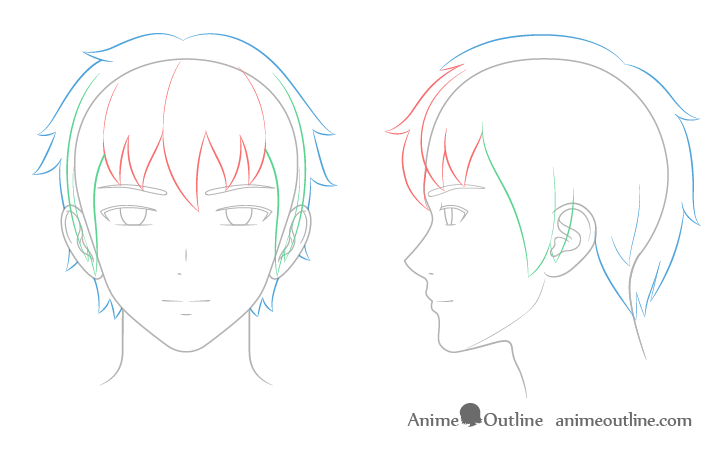 This step by step tutorial shows how to draw an anime or manga male head and face from the front and side views. 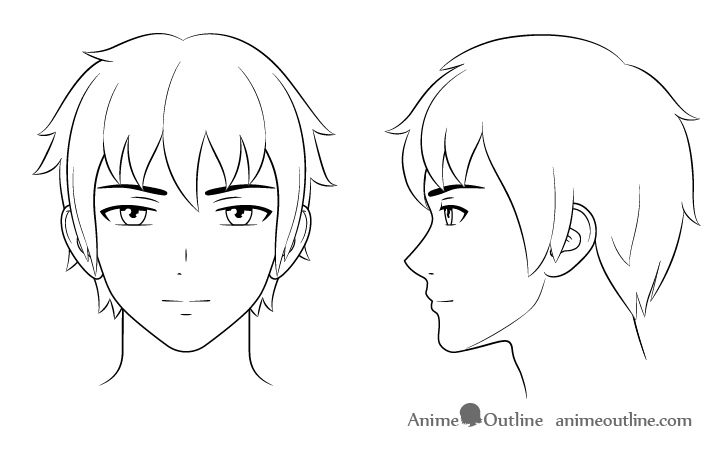 In this tutorial we will be drawing what can be the face of a young adult or high school age male anime character. 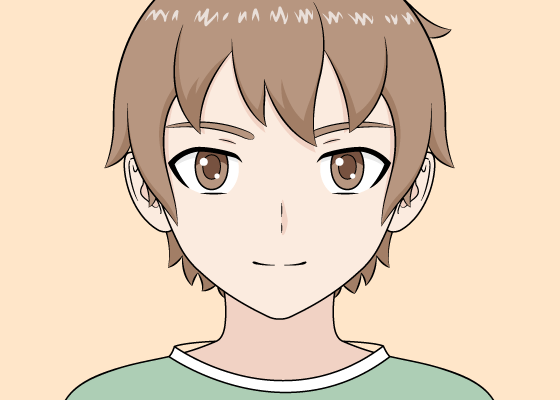 Manga and anime male characters of this age tend to have larger chins and longer faces with smaller/narrower eyes when compared to their female counterparts or younger males. Though this can also vary based on style. If you are going to be following the tutorial with pencil and paper be sure to draw light lines until you are done with the facial feature and hair placement steps. You will need to erase parts of the drawing afterwards. 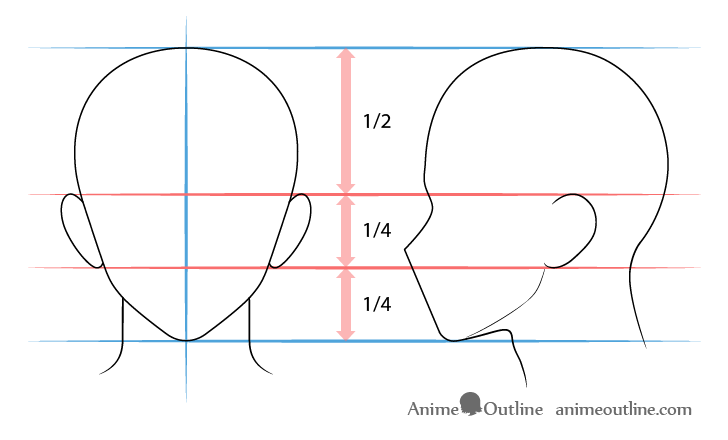 Draw a vertical line for the middle of the head to help you see if both sides are even. Make the top part of the head close to a circle and from there project two lines angled inwards towards the middle of the face followed by a set of curves and two more angled lines pointing further inwards. Join the two sets of lines at the chin. 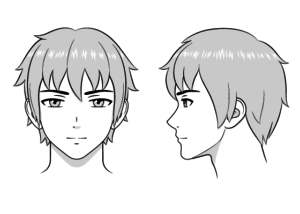 Draw the chin itself with a small curve but don’t make it too pointy or the character will look less masculine. 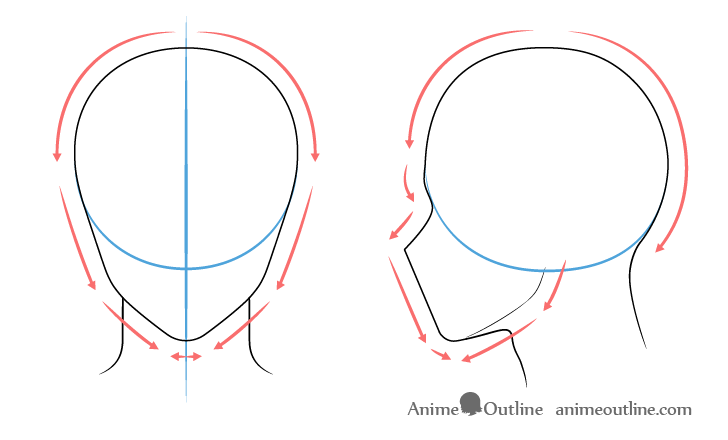 Draw the top of the head close to an oval in shape. Make a small bump around the eyebrow areas followed by an indent that transitions into the nose area. You can see step four of this tutorial for positioning the nose. But do your best to estimate it’s placement at this point. Also at this stage you can simply draw a straight line from the tip of the nose to the bottom of the chin. 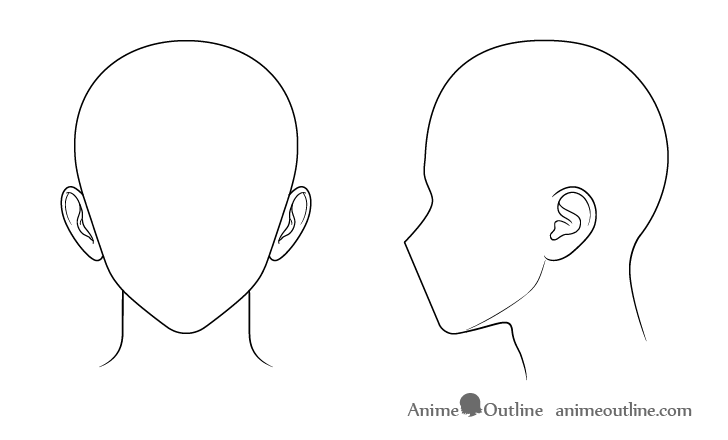 Add the bottom of the jaw by projecting a line form slightly above the oval and then curving it into another line that basically transitions into the chin. To position the ears draw a vertical line through the middle of the head and another line between that and the chin. Draw the ears with their top and bottom between the two lines. You can see the inner details of the ears above but you may want to save drawing these for after you place the rest of the facial features. The bigger and wider you draw the eyes the younger your character will look. 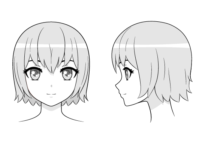 In this case the character is a young adult (or close) so the eyes will be smaller then those of a boy. Draw the eyes with their top portion touching the horizontal halfway point through the face (use the line from the previous step) and leave enough space between them to fit another eye. Please note that the eyes will only be positioned this way when in their natural state if they are open wider they can go past this line and if shut they will usually go below the line. For now you can simply draw the their basic outline. The details will be added in a later step. Draw the eyebrows slightly above the eyes. 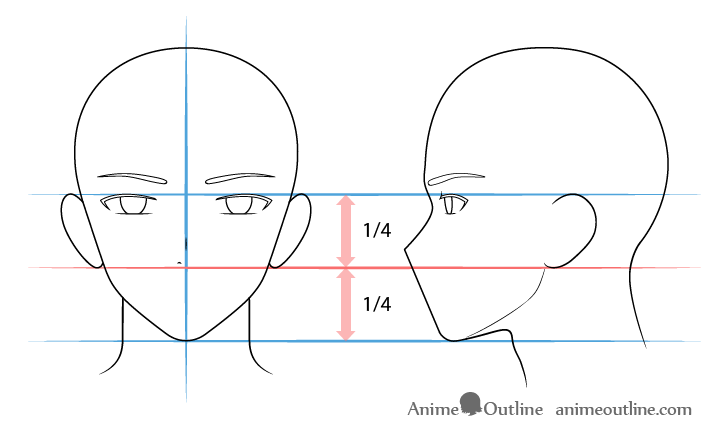 Anime and manga male eyebrows are often drawn thicker then female ones especially in older characters. But it also depends on the style. Place the details of the nose so that its bottom would be at the halfway point/line between the top of the eyes and the bottom of the chin. Please note that the actual bottom of the nose will not be draw. Show the nose by drawing a small vertical line for the bridge and giving a hint of one of the nostrils (slightly above the placement line). 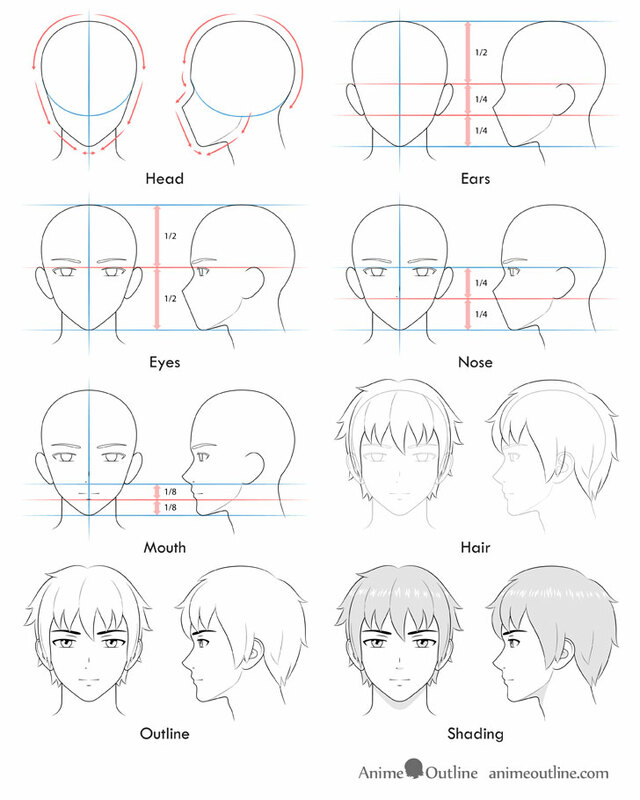 If you are drawing the side view of the nose you will want to draw the bottom of the nose and the mouth at the same time as they basically transition into one another. Finally position the mouth by drawing a line between the bottom of the nose and the bottom of the chin. This line will give you the position of the bottom lip. Draw the top lip just slightly above this. You can give a hint of the bottom lip with one short line. 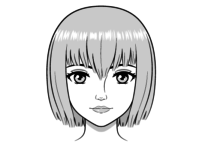 Draw the mouth itself with a light curve and a small break int the middle. 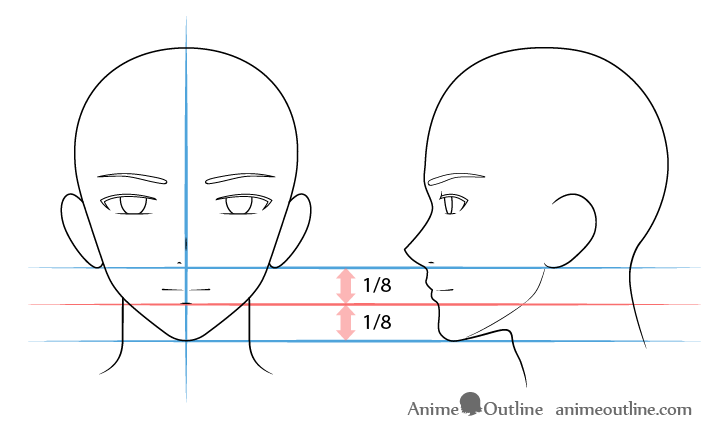 Also please note that generally adult or older teenager male anime and manga characters tend to have wider mouths then females. Draw the hair over top of the head. 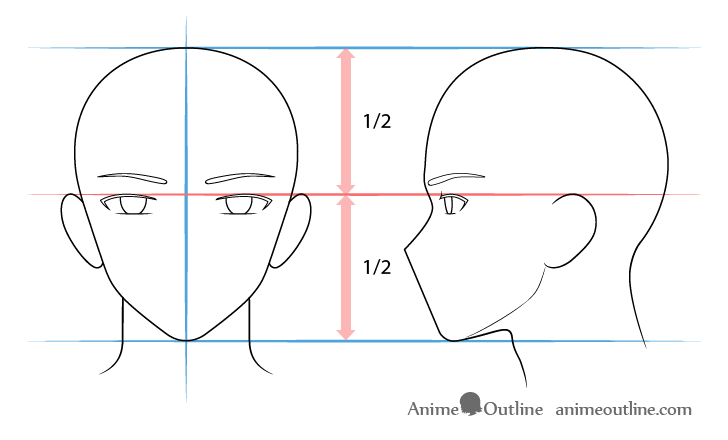 The reason why you want to draw this way instead of just drawing the hair right away is because being able to see what the head looks like will help you position the facial features (as done in previous steps). It will also help you place the hair itself as you can see exactly how it sits on the head. To get that “anime hair” look draw the hair in fairly large pointy clumps. 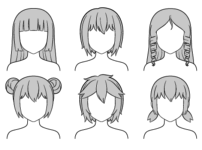 To help you better understand how to draw the hair it can be very helpful to think of it as split into three parts (front, side and back/top). Viewing the hair this way can be especially helpful when drawing when drawing hair that’s being pulled or blown in different directions. For more on this see the tutorial below. 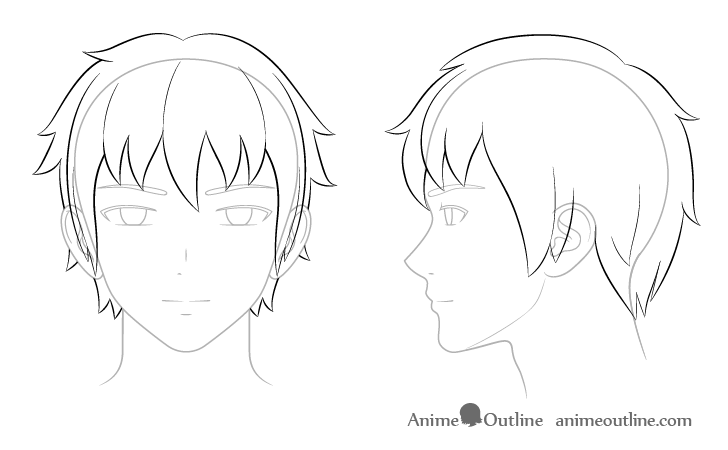 You can draw the inner details of the ears (shown in step 2) either before or after drawing the hair. Erase the parts of the head hidden by the hair and add the smaller details of the eyes such as the pupils and highlights. Afterwards you can also go over your drawing with darker lines and add black fill or pencil shading (depending on what you are drawing with) to parts of the eyes and eyebrows. After you finish this step you should have a clean line drawing of the face. You can leave it at this stage or move on to the next step if you want to add shading. 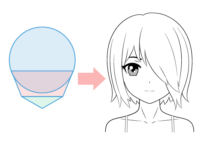 For some very basic anime style shading (also known as “Cel Shading”) add it in places where shadows are most likely to occur in general lighting conditions. Also darken the hair and the irises of the eyes but leave the highlights in both areas white. 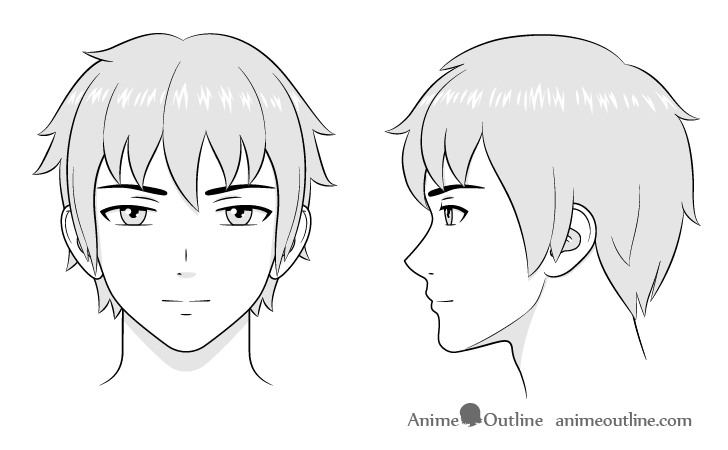 Male anime heads and faces can vary depending on style but generally the older the character the more they tend to differ from their female counterparts. 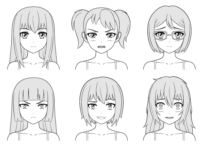 Younger characters usually have faces very similar to females while older characters are often drawn with longer faces, smaller eyes and better overall defined facial features.